Our knowledge of the origin and early evolution of birds has exploded in the past ten to fifteen years. In the 1990s alone, scientists became aware of approximately three times more species of early birds than were previously known, marking the first 85 million years of avian development as a period of remarkable species diversity. Assembling work by an international group of renowned scientists, Mesozoic Birds: Above the Heads of Dinosaurs is the most authoritative and up-to-date source on early avian evolution currently available. This unique resource provides a comprehensive examination of the known fossil record and is also an unparalleled guide to the fast-paced developments in current research. 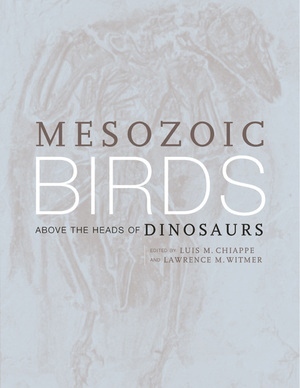 Mesozoic Birds: Above the Heads of Dinosaurs covers a wide range of topics, including discussions of avian origins, the fossil record of feathers and footprints, bone histology, and locomotor evolution. Controversial taxa such as Protoavis, Caudipteryx, and Mononykus receive special treatment. But the heart of the volume presents the anatomy, relationships, and paleobiology of the undisputed Mesozoic aviary. Some of the book's most exciting features are the new definitive descriptions and illustrations of taxa that previously have received only brief notice, such as the alvarezsaurid Shuvuuia; the enantiornithines Sinornis; Eoalulavis, Vorona, and Patagopteryx; and the hesperornithiform Enaliornis. The origin of birds and their relationship to dinosaurs continue to be hotly debated among paleontologists, ornithologists, and evolutionary biologists. This cutting-edge reference will become an essential resource for those interested in this debate and in the many other fascinating topics relating to the evolution of the earliest known birds. Luis M. Chiappe is Curator and Chairman of the Department of Vertebrate Paleontology at the Natural History Museum of Los Angeles County. He is the coauthor of Walking on Eggs (2001) and The Tiniest Giants (1999). Lawrence M. Witmer is Associate Professor of Anatomy at Ohio University College of Osteopathic Medicine and author of The Search for the Origin of Birds (1995).